The sampled wells, marked in red, are the two that were shut down last year. Tucson Water has shut down a third well near Davis-Monthan Air Force Base for safety reasons. Two others were closed last year due to elevated levels of chemicals, exceeding the Environmental Protections Agency’s health advisory recommendations. Tucson Water Public Information Officer Fernando Molina said the third well, closed at the end of June, contains almost 30 parts per trillion of two per- and polyfluoroalkyl substances, PFOA and PFOS, or PFAS for short. PFAS has no federal maximum contaminant level for drinking water, but the health advisory level is 70 parts per trillion. One well has PFAS levels of 2950 parts per trillion and was closed in June 2017. The other well has 97 parts per trillion and was closed in January 2017. These chemicals and another contaminate, a form of dioxane, were originally found at levels exceeding the EPA health advisory in two Tucson wells just north of D-M. Dioxane also has no federal maximum contaminant level for drinking water, but the EPA has a health advisory level of 0.3 parts per billion. Although the third wells' levels of PFAS are below the EPA's health advisory limit, Molina says the city shut it down for safety reasons and that the city has identified the next ring of four wells to sample for contaminants, to the northwest and east of the recently-closed wells. 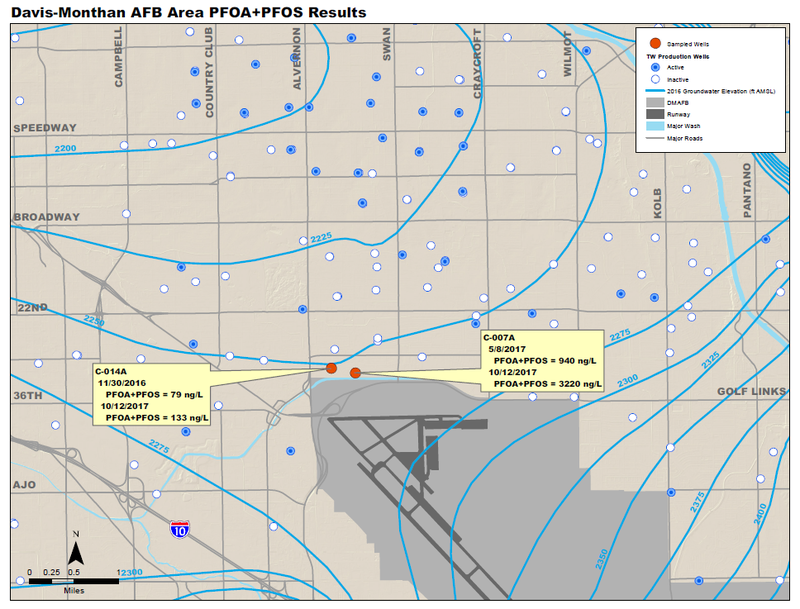 In August and September 2016, Tucson Water shut down six wells on the city's northwest side that contained elevated levels of either PFAS or dioxane. Molina says shutting down these wells doesn't have a huge effects on Tucson because the closed wells saw minimal use. "Our standard procedure when we detect contaminants at wells is to take them out of service and bring water in from clean sources," Molina said. "Once that is complete, we start our investigation procedures to try and determine the magnitude of the contamination and the concentrations in the plume." Most of Tucson's water comes from the Avra Valley Recharge Center, which processes Colorado River water. There are also wells with the same contaminants, though at much lower levels, in parts of Marana. Marana Water’s Deputy Director Scott Schladweiler said Marana Water is working with Tucson Water, the Metropolitan Water District and Pima County Wastewater to determine the source of the contaminants. "Davis-Monthan began using the AFFF for fire response in 1971. The process for clearing released foam depended on the location. For hangars, the Air Force obtained permission from the county to dilute and discharge into the sewer. For runways, it washed off into the soil." Molina says Tucson Water hasn't found a connection between the polluted wells in Tucson and those in Marana. And he says the city hasn't made any official conclusions on where the contamination came from but that Tucson Water collaborating with D-M to figure it out.